There’s nothing like getting on your motorcycle. The power of the engine, the freedom of two wheels, and the feeling of the wind whipping by you while you’re out on the open road. We know that a motorcycle isn’t for everyone, but those who love their bikes, really love their bikes. That’s why we thought we should let our motorcycle enthusiast guests know about the upcoming Englewood Bike Night. The Englewood Bike Night is an event that brings together motorcycle fans from all over Florida, so if you’re a bike fanatic who happens to be staying with us while the Bike Night is taking place, you’ve got to check it out. The Englewood Bike Night is put on by the Moose Riders, and will be taking place Saturday August 18th on historic Dearborn St., just a ten-minute ride from the resort! If you’re won’t be here over that particular weekend, don’t worry, The Englewood Bike Night is a recurring event that happens the third Saturday of every month. The festivities start at 5:00pm and run until 10:00pm. If you’re into bikes, you’ll love heading down to Dearborn St. and hearing the collective roar of dozens of powerful, custom motorcycles. Of course, checking out other riders’ bikes won’t be the only thing to do at the Englewood Bike Night. Plenty of restaurants are open to the bike enthusiasts that drive down Dearborn during the event. Some of our favorite spots, like the Mango Bistro, Bobarino’s Pizza, Englewood’s On Dearborn and more are going to be open and expecting some bike lovers’ business. Not to mention, the Englewood Bike Night also hosts live entertainment! The upcoming event will have South Western Florida’s own Storm Warning headlining, playing their brand of funk-inspired blues rock. They’re not the only ones that’ll grace the stage on Bike Night though. Performers change month to month, so you always get to experience something new. Past performers have included: The Copperhead Band, and Maiden Cane. Plus, there’s raffles, giveaways, 50/50 draws, and plenty of vendors tailored to the enjoyment of a bike enthusiast. If that weren’t enough, proceeds from the event go towards supporting Moose Riders charities, like: Friends for the Advancement of Musical Education (FAME), Englewood Area Cancer Foundation, Helping Hands, and many more. So, swing by Dearborn, gawk at some gorgeous bikes, enter some raffles, and support local charities while you’re doing it. If you love motorcycles (or even if you’re just looking for a fun night out), there’s no reason not to check out the Englewood Bike Night. Make an evening out of it by bringing the whole family to enjoy some delicious food, take in some good music, and talk motorcycles with other riders on one of the liveliest streets in Florida. For more information about the Englewood Bike Night, check out their website right HERE. For more events happening in the Englewood area, keep checking wannaB.com, and don’t forget to follow us on Facebook, Twitter, and Instagram so you don’t miss a minute of what’s going on at the resort! Our guests know that we’re always on the lookout for exciting events around the resort, because we love to brighten up their stay with us. Nothing brings us more joy than watching our guests’ shining smile and glow on their face when they recount the great time they had experiencing a special occasion in the area. Hey…bright…shine…glow?! That’s right! The annual Blacklight Run is taking place in Tampa next weekend, and we know our guests are going to love it. The Blacklight Run’s website bills the event as ‘none other than the brightest, most fun 5K out there.’ But don’t worry, if you’re not the type to go out and run a marathon you can still have a blast at the Blacklight Run. Instead of making the event a competition, the organizers welcome ‘any and all participants looking for a glowing good time.’ As the name implies, blacklights play a key role in the event. During the 5K participants will be covered in UV glow powder. The powder is illuminated in blacklight zones, and creates an amazing effect when everyone is grouped together…say, like at an after party maybe? One of the coolest parts of the Blacklight Run is the after party. After you cross the finish line is when the Neon Sky celebration begins. With live DJs playing music and lighting up the sky, and event-goers participating in a ‘glow throw’ – that’s where the glow powder is thrown into the air, creating a luminous spectacle – there’s no shortage of awesome photo ops for you avid Instagram users. As if that weren’t enough, free merchandise will be given away at the after party as well, and who doesn’t like free stuff? Not only is the Blacklight Run a great time, it benefits the Bulls for Kids charity as well. The Blacklight Run is committed to raising children’s cancer awareness, and you can feel good about supporting a cause while you have the time of your life lighting up the sky with your glow powder. We highly recommend checking out the Blacklight Run when it comes around this August 18th. It promises to be a great time, and to shine a light on children’s cancer awareness. For more information, you can check out the Blacklight Run’s Tampa website right HERE. Stay tuned to wannabinn.com for more cool events and happenings around the resort, and don’t forget to follow us on Facebook, Instagram and Twitter so you don’t miss a thing! Now that another hot summer is officially underway, and July is just beginning, it’s time to think about Independence Day! We’re not talking Will Smith and Jeff Goldblum staving off alien invaders, we’re talking back yard barbecues, cold drinks, and some fireworks to finish off the night! July fourth is the best day of the year to celebrate being a part of the United States of America, and there’s no better place to do that than at the wannaB inn. There’s plenty to do, and lots of fun to be had around the resort, so let us give you a hand if you’re looking to make this Fourth of July a truly memorable one. The famous 900 feet of Gulf of Mexico facing beachfront at the wannaB is stunning to look at on its own. You could almost make your entire Fourth of July by just hanging out, relaxing with the family, playing some catch or tossing the ol’ pig skin around. Did you know that we’ve also got barbecues available for you to use as well? It’s true! Bring out the burgers when you head down to the beach, because nothing says ‘Independence Day’ like a good old-fashioned barbecue. Our charcoal grills are just the thing to take your day at the beach and kick it up a notch American style. Just don’t forget to bring your coolers, chairs, and whatever else you pack for the beach back to your room with you when you’re finished. We wouldn’t want to ruin the Fourth of July for our friends the Sea Turtles. Maybe you don’t feel like cooking, and why should you? You’re on vacation! 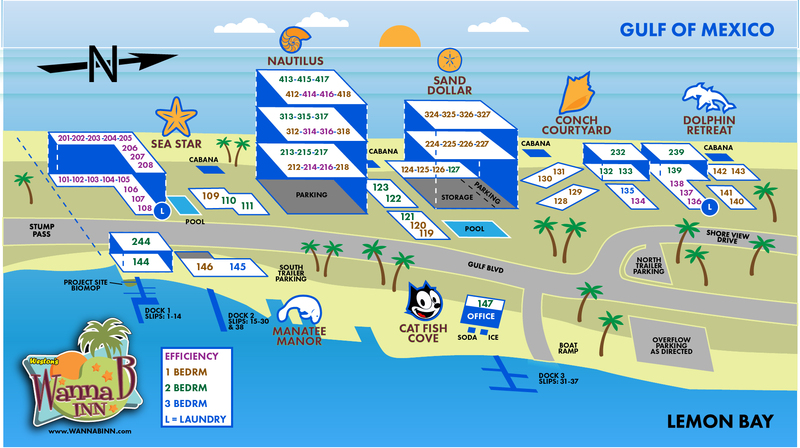 No need to worry, there are plenty of local spots around the resort to grab some grub or down some drinks. We can’t think of anything more American than a nice, juicy hot dog though, and it just so happens that hot dogs are Mad Dogs Hot Dogs specialty. Located in Venice, Florida, just a twenty-minute drive from the wannaB, Mad Dogs offers an entire menu dedicated to the hot dog aficionado. Take a hot dog tour around America with a New Jersey Ripper Fried Dog, a New York Style Dog, or an authentic Chicago Vienna Dog. Heck, it’s Independence Day…why not get all three? Just make sure you don’t fill up so much that you miss out on the Lemon Bay Rotary Club’s annual Fourth of July fireworks. Not only are we a sponsor of the event, we look forward to the show every year. It doesn’t feel like the Fourth of July until the sky is lit up with a beautiful display of lights and colors. The fireworks show will be held at 9:00 PM on Blind Pass Beach, located on Manasota Key Road, a quick eleven-minute drive from the wannaB. Finish off your Fourth of July celebrations with a bang by bringing the whole family to Blind Pass to enjoy the Lemon Bay Rotary Club’s fireworks display. For more information, click HERE. No matter what you find yourself doing on Independence Day, the important thing is that you have fun. If you need a few more suggestions, don’t be afraid to ask our lovely and helpful staff…no one knows more about the area surrounding the wannaB than they do. Have a great Independence Day everybody! Here’s to 242 more! There’s no getting around the fact that this summer has been a hot one so far. With temperatures hovering around 90̊ cooking a hot meal can seem more exhausting than anything else. When the heat really starts to rise, we here at the wannaB really enjoy a lot of fresh produce. Crisp vegetables, ripe fruits, all mixed together in a big bowl with a light vinaigrette? Our mouths are watering just thinking about it. Plus, when the meal is light and refreshing, you won’t feel bogged down the way you might after a heavy lunch or dinner, so you’re free to get out and enjoy some activity in the sun. Now you’re thinking, “that’s great, but where are we going to find fresh produce around here?” Lucky for you, we know the area well, and we’ve got just the place. The Punta Gorda Farmer’s Market is open every Saturday and has more fruit and veggies than you can shake a stick at. One trip to this brilliant bazar and you’ll see exactly what we mean. 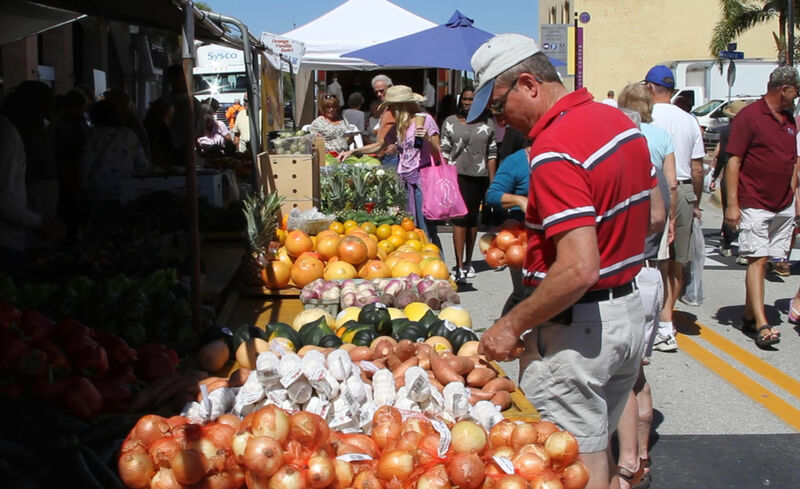 The Punta Gorda Farmer’s market kicks off early at 8:00 am every Saturday and runs until 1:00 pm. Just in time to bring your haul back to the wannaB and whip up a delicious lunch. Located just a 45-minute drive from the resort, on Taylor St. in Downtown Punta Gorda, it’s the perfect thing to make a morning out of. And it might just take the whole morning to browse the wide selection offered by the various vendors. The Punta Gorda Farmer’s Market is no joke. With over 50 regular vendors in attendance each week, you’re bound to find something to make your next meal shine! We love checking out what Merlin’s Plants has grown, satisfying our sweet tooth at Sugar Island Cupcakes, grabbing something for a light snack at Dynasty Guacamole, and topping it all off with some fresh baked goods from OL’TIME German Bakery. Not hungry? Plenty of clothiers, jewelers and wellness specialists set up shop at the Farmer’s Market each week as well. There’s even something for your fur-ever friends, with homemade pet treats from Woof n’ Purr. To peruse a full list of what can be regularly found at the Farmer’s Market, click HERE. Voted the best small market in Florida and 15th in the entire USA, the Punta Gorda Farmer’s Market will not disappoint. Not to mention, you can feel good about spending some time supporting Florida grown produce and local Florida businesses. There’s nothing like tasting a creation of your own put together by some delicious and fresh ingredients. So, head on down to the Punta Gorda Farmer’s Market to see what we’re talking about. We think you’ll find just the thing to prepare a refreshing meal for those hot summer days ahead. Get Ready for the Third Annual Tarpon Festival!